Finland: Media Context | Profile: Faktana, kiitos! Media experts and journalists in Poland say that intentionally misleading stories are currently not an everyday occurrence in the country, but they warn that content from the government-controlled public broadcaster, often only a very thin line away from outright propaganda, is making matters worse. Over the past two years, Poland has been among the countries captivated by the widely publicised “phenomenon” of “fake news”, experts and journalists recently told the International Press Institute (IPI). Aspects of this phenomenon have been visible in public and private media, and increasingly on social media. Like many other countries struck by rapid developments in the media climate, Poland has seen the term “fake news” applied to a variety of content, from “clickbait” journalism to hoaxes, overt misinformation and propaganda. For their part, Polish media outlets have provided coverage of the issue, seeking to define the term and offer insight into possible sources. Kamila Ceran, the editor-in-chief of Radio TOK FM, said that one type of content that stands out is public media propaganda, which she described as being “not fake news per se, but often lies by omission”. 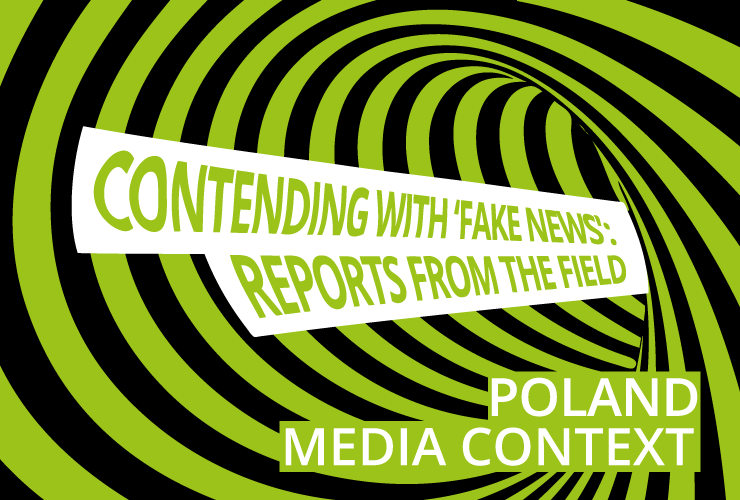 Media audiences in Poland also are exposed to internationally well-recognised conspiracy theories and fake stories, including, for example, those related to the anti-vaccination movement or “chemtrails”. Still another type of “fake news”, Ceran noted, can be traced back to Russia and its government’s suspected attempts to exploit and influence Poland’s political climate. The main problem in assessing the scope and effect of “fake news” and related phenomena in Poland, media experts told IPI, is the increasing polarisation in the country’s public sphere and, consequently, media climate. The ruling Law and Justice (PiS) party has essentially taken over the public broadcaster, TVP, amid a constantly narrowing space for media freedom in the country. TVP is widely seen by the opposition and independent media as the ruling party’s propaganda outlet. Dorota Głowacka, the coordinator of the Observatory of Media Freedom in Poland, told IPI that while most mainstream media organisations have had some trouble with the “fake news” issue, the systematic problems in the country’s media climate have created a division that makes it difficult to define and address these problems. “Information broadcast on public television now can be manipulative, misleading, or simply untrue,” Głowacka said. Andrzej Krajewski, a member of the foreign affairs committee of the Society of Journalists, an independent journalist group, told IPI that the divisions make it difficult to pinpoint what exactly qualifies as “fake news”. Krajewski noted that a lot of the misinformation, especially content presented by the public broadcaster, centres on immigration and nationalism, and has changed the public perception of immigrants for the worse. Głowacka said that sensitive issues in Poland draw considerably more “fake news” and misinformation. Currently, she said, those issues are immigration and abortion. She also said that right-wing views seem to be far more common in “fake news”. Smear campaigns are often launched against those opposing the government agenda, Głowacka also recounted, pointing to recent campaigns in the public media smearing members of civil society and others. 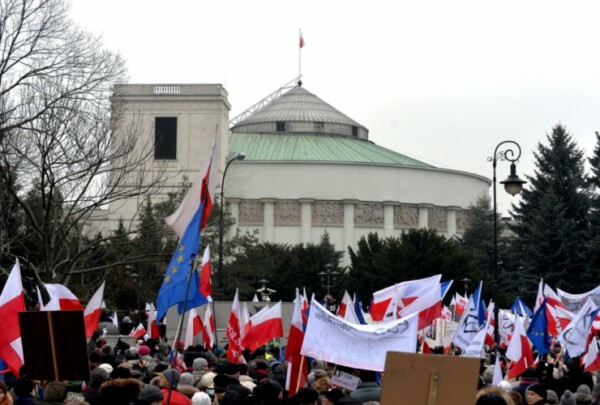 This year, the Polish government took legislative steps to control the funding of non-governmental organisations in a move that was widely criticised as an attempt to dismantle democratic institutions and civil society. Głowacka said the “reforms” were preceded by stories smearing people running NGOs, highlighting their family and political connections. Another recent example was seen when Polish doctors demanding increased funding for public healthcare started a hunger strike, triggering demonstrations in support. Głowacka noted that public media first completely ignored the issue, but later turned to discrediting the demonstrators, claiming that they wanted more money for themselves. A third smear campaign, also visible on social media, came during massive protests over planned judicial reforms last July. Głowacka said that organised attempts to discredit protesters and protest organisers in public television broadcasts and social media campaigns were made to look like grass-roots efforts. As Poles – and especially the country’s youth – increasingly rely on digital-only news sources and social media, political influence and misinformation in that sphere have become more systematic. According to the Reuters Institute Digital News Report 2017, over half of all Poles use Facebook as a news source, signalling a move away from national dailies and television. A 2017 research paper for Oxford University’s Computational Propaganda Research Project, “Computational Propaganda in Poland: False Amplifiers and the Digital Public Sphere“, provided an overview of a study on social media bots – automated accounts that mimic users – as well as fake accounts and other “false amplifiers” closely connected to “fake news”. The study found, for example, that more than 52 percent of suspected Twitter bot accounts analysed could be classified as right-wing accounts, many spreading disinformation from untrustworthy channels and partisan blogs posing as legitimate news outlets. 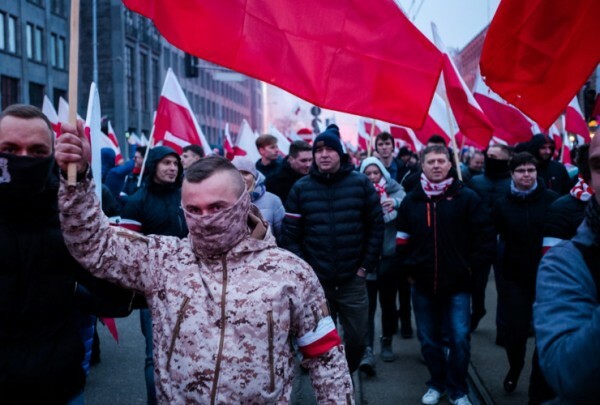 It also noted that individuals interviewed suggested that Polish right-wing and nationalist groups were mobilising on social media in very effective ways. Researchers also provided an overview of the perceived Russian disinformation campaign targeting Poland, which some observers believe has been active on Polish social media since 2013. Fake accounts and other operations originating in Russia or linked to its government are increasingly suspected of spreading dubious and sometimes fabricated information to stir tensions in Polish-Ukrainian and Polish-Russian relationships. In 2017, the Warsaw-based Centre for International Relations examined Russian efforts to manipulate public opinion in neighbouring countries. Its report, “Information warfare in the Internet: Countering pro-Kremlin disinformation in the CEE countries”, cited the example of multiple “journalists” and “bloggers” having published dubious information spread on Facebook and Twitter during the 2016 NATO summit in Warsaw – information that then was picked up by Polish news organisations. Media experts interviewed by IPI shared a degree of pessimism about tackling the problems of misinformation and “fake news” in Poland, mainly due to the harmful divisions in the media environment and the government’s attempt to further control or “repolonise” the media, forcing out foreign owners. Such a move, the experts agreed, would not bode well for the already troubled state of media freedom. Ceran noted that many media outlets still try to debunk conspiracy theories, half-truths and propaganda. However, she emphasised, the workload is huge and not many people are satisfied with the results so far. Ceran said that while many smaller media outlets do well in trying to combat “fake news”, there are significant obstacles to these attempts to educate people. She said education in Poland is also increasingly in government hands, meaning that teachers and even textbooks have to toe the government line. Consequently, she said, it becomes much more difficult to teach young people about curiosity and making distinctions between “real” and “fake”. Krajewski lamented that the standard practice of impartial media ¬– scrutinising the official government line and stories, and offering criticism, as relevant – is now “considered as proof that independent media is not following the will of the people”. ABOUT THIS SERIES: IPI’s reporting project Contending with “Fake News” examines the particular dynamic around the “fake news” debate in five EU countries, offering a look a the sources, styles and goals of disinformation in each country as well as the extent to which that debate has affected public discourse, politics and press freedom. The series also profiles five initiatives that have adopted innovative solutions to addressing disinformation and building trust in fact-based journalism and that could potentially serve as models for similar efforts elsewhere. Read more.